Trying to make your Christmas lighting display different each year can be a challenge and some inspiration may be needed to get the juices flowing. Here you'll find some great Christmas outdoor lighting ideas that will make your holidays much more fun for both kids and adults. LED Christmas lights will spruce up your holiday decorations. Their vibrant color and brightness add that extra sparkle you'll love. Because outdoor LED lighting is much more resistant to bumps and shocks, you can expect these lights to work for years to come. You can find these lights at most retailers. They may not be so new anymore but I still love the way icicle lights look at Christmas time. The way they hang down from the eves of your home really make me feel like winter is officially here. With so many choices to choose from, where do you start? Take a look at the outdoor string icicle lights. You can even find icicle lights that look like real icicles. They will add a realistic charm to your Christmas icicle lighting theme. 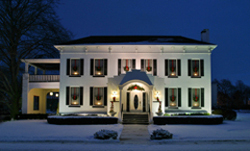 Use rope lighting throughout your outdoor Christmas lighting display. I love rope lighting because of its ease of installation and cleanup. You don't have to worry too much about making a mistake because outdoor rope lights come evenly spaced and ready to install. They also come in so many different colors. Use them to outline a door, a window, or just wrap them around the trunk of a tree. Whats even better news is that you can use your Christmas rope lights for other outdoor party lighting needs througout the year. Ever wonder how big ticket productions are created? How do these geniuses figure out how to make lights react to the mood of the music being played? How are they able to make the lights dance at exactly the same time that the music playing hits a high note? Outdoor lighting controls enable you to become the conductor of your own orchestra of dancing lights. You can really create an emotional connection with spectators combining lights with music which will definitely have a profound effect on people. Unless of course, you have poor choice in music. How could we ever forget about those memorable illumated lawn ornaments so commonly found on just about every decorated home we see during the holidays? There are so many to choose from which include blow up lawn ornaments, plastic illuminated lawn ornaments, and LED illuminated lawn ornaments. The colors and funny characters make us feel like a kid again and bring all the fun and excitement that warms children's hearts to light during the Christmas season. If you'd like to share any of your Christmas outdoor lighting ideas with me, please reach out me by clicking here. I would love to hear your feedback and share it with others.